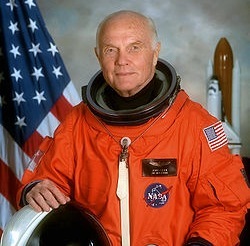 I recently watched a short PBS News Hour piece about the American hero John Glenn. Fifty years ago, Glenn became the first person to orbit the earth and he was being interviewed about that historic – and extremely dangerous – flight and about his thoughts on today’s space program. Towards the end, the interviewer asked Glenn – who is 91 years old – a question I’m sure was on every viewer’s mind: How did he manage to keep in such great physical and mental shape? “A good attitude and exercise” was his immediate reply. John Glenn at the time of his second space flight. He was only 77 at the time. Interestingly enough, the words attitude and aptitude share a linguistic root. One definition of aptitude is “the state or quality of being”. Glenn’s “state of being” seems exceptional for a person of his age. What I find interesting about these definitions is that suggest a physical link to what is usually considered a mental state – that the way you organize your body can affect your attitude. This is not be at all surprising to Alexander Technique students and teachers – the Technique is all about releasing habitual tensions that get in the way of free self-expression. Many of us have experienced improvements in our general attitude towards life as we’ve freed ourselves from those tensions. I can still vividly remember a residential Alexander Technique workshop I took in rural England a few months after I started with lessons. The afternoons were largely free and I would often use that time to explore the narrow one lane roads in the neighborhood. I was struck by how much easier my walking had become – but even more by how unexpectedly happy I felt. Here’s a little experiment you might want to try right now: Let your attention go to some situation in your life that concerns you. Notice your attitude towards it. Then, quietly say this to yourself for a few seconds: “I am not tensing my neck.” Say this without any effort or expectation on your part. Now let go of that neck-intention for a few seconds and then bring it back, again for a few seconds. Shift back and forth a few times. Now, thinking back, did anything about your attitude toward the situation change during your experiment? And what do you notice about your attitude right now? Thanks Mark. I agree that most people accept mind-body connection in theory, but what I like about the Alexander Technique is that it teaches people to experience it’s reality in a clear direct way. Actually more than mind-body connection – mind-body unity! Very interesting blog, Robert. It does seem that attitude and aptitude do have a lot to do with each other, and well demonstrated in your example about walking – with an improved attitude your walking (or your aptitude for walking!) also improved. Thanks for a lovely post, Robert. The link between what we do physically and our psychological state is one of those things that sometimes gets short-changed. But one of my very favourite chapters in FM’s books is the final one in CCC: Sensory Appreciation in its Relation to Happiness. I am always touched by his comments on how we are taught that the ordinary acts of life should be automatic, and that we therefore lose the joy that can be found in them. The joy of doing something as simple as walking is a discovery that my students remark upon frequently. Thanks Jennifer for this – I’d forgotten about that chapter. Time to get back to Alexander’s writings a bit more I guess! Notch the ground by compacting the sand, and budget while providing school bus exemplary services in minimal costs. will have to worry about. Solving one problem in your area. it better than estimating by the due dates.